Back River Light was built in 1829 by Winslow Lewis at a cost of $5,000. It was constructed on a four-acre lot six miles north of Old Point Comfort between the Back River entrance and the Grandview area of the City of Hampton, Virginia. It was a conical brick tower that was whitewashed. The original lantern contained ten oil lamps with ten reflectors. A one story, brick keeper’s house was built at the same time as the construction of the light. A footbridge was built to span a marsh and connect the keeper’s quarters to the tower. In 1855, the installation of a new revolving machine containing six twenty-one inch parabolic reflectors and six fountain lamps improved the light. Confederates vandalized and ruined the light in 1862 during the Civil War. The keeper’s house was enlarged in 1894. Starting in 1868 efforts were made to maintain and protect the structure from erosion with riprap, screens and concrete walls. The annual Lighthouse Board report stated in September 1888, "450 cubic yards of riprap stone were deposited around the lighthouse to protect it from the advance of the sea." 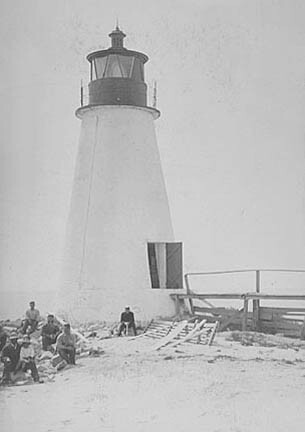 In 1914 the keeper’s quarters was dismantled and in 1915 the light was automated and it was decommissioned in 1936. Over the years the lighthouse was allowed to deteriorate. The remaining structure was destroyed during Hurricane Flossy on September 27, 1956 with only a pile of rocks marking the site today.